Charlotte Taylor running for her university team. Nene Valley Harrier Charlotte Taylor announced her arrival into the big time with a fourth place finish at the European Cross-Country Championships Under 23 race at Chianti in Sardinia on Sunday. The 22 year-old from Spalding had qualified impressively for the GB team in the trials at Liverpool last month, and started the race with conviction running towards the head of the field in front of a live television audience. As the latter stages approached, Taylor found herself in a breakaway group of four runners including her England team-mate Alice Wright. In a frantic finish the battling Harrier was outsprinted by her rival for third place, but despite missing out on an individual medal Taylor was part of the gold medal winning GB team. Reflecting on the race Taylor said: “I’m definitely not disappointed with fourth. In fact, I’m really pleased that I was able to finish that high up. “I really enjoyed the race. I was feeling good running with the lead group for the first half of the race, and then when the pace started to pick up I just tried to follow the moves as best I could. Now based in the USA on a scholarship with San Francisco University, Taylor first represented Nene Valley in 2006 as a 12 year-old. She developed into a fine multi-eventer, but realised in 2009 that distance running was where her future lay. 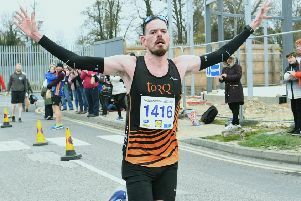 Taylor won Peterborough Grand Prix 5k races as a teenager, and continued to impress as an athlete at Warwick University. In 2015 she attained her scholarship and has not looked back since. In recent weeks Taylor has raced in the two biggest National Collegiate Athletics Association cross-country meetings of the year on consecutive weekends. She was second in the West regional championships and 10th in the national championships. Taylor will return to California after Christmas and intends to race indoors at the beginning of the new year before focussing on the outdoor track season. She will be hoping to revise her PBs over 5,000m (16.05) and 10,000m (33.25). Reminiscing on her days as a developing runner Taylor said: “ Idefinitely owe a lot to both Arthur Simmonds and Dave Clay, the coaches I trained under at Nene Valley as a youngster.